"When Putin announced in the fall of 2011 that he was coming back, I had no illusions," Clinton said. "I wrote a memo to the President, in fact I wrote two memos to the President, pointing out that we were going to have to change our thinking and approach. We had gotten all we could get from the reset." President Obama and President-Elect Putin agreed that the successful reset in relations should be built upon during the coming years. "Built upon" is not the same as "gotten all we could from" or "change our thinking and approach." Finally, finally, the media are exhibiting a bit of scepticism about whatever the latest ISIS outrage is. The claim that ISIS had ordered female genital mutilation -- reported by a UN official on video-conference from Erbil (i.e. not in an ISIS area) is already being debunked. And it never made sense. FGM occurs in some Arab countries (generally the poorer ones or the poorer areas thereof) but it is not in the culture of the Levant or Gulf countries (despite occasional attempts by Islamophobes to claim that it is). Now if only we could get more acknowledgement that the ISIS $400 million bank robbery, the ISIS tweet to Lionel Messi, the $3000 Rolex on the Caliph, and the 1800 year-old church burning were also fake. Folks, they do enough bad real stuff that you really don't need to fall for this unholy alliance of link-chasers and notoriety-seekers. We have longer run plays that we’re running. Part of this is keeping your eye on the long game even as you go through tumultuous periods. The problem with this is its assumption that the White House is the only one playing the long game. In fact, none of the crises that they are dealing with are easy to understand from the perspective of short-term gains, since the various players (Vladimir Putin, Bashar al-Assad, Hamas, ISIS) are all suffering significant costs for their current adversarial roles. The question needs to be: where will these crises stand 2 years from now? And the White House doesn't have a particularly good story for why things will look better than they do now. In the mid-afternoon cable news cycle (US East Coast), it was clear that the big crisis in Israel was not the hundreds of deaths in Gaza but the fact that foreign airlines had suspended service into Tel Aviv for 24 hours. In fairness to the cable news talking heads, they were clearly reflecting what they were hearing from the Israeli government. Anyway, it must have been one of those cognitive dissonance moments for Fox News viewers, inculcated in the belief that Europe hates Israel, to hear the list of mostly European carriers that normally fly to Israel. Given that the Israeli government is usually portrayed as being strong in strategy and public relations, it seems like a strange blunder to make such a big deal about the flight cancellations. They've told the world their point of sensitivity. European airports have bad days for various reasons -- strikes and weather -- but after the disruption has passed, things return to normal. So the claim that it's concern about "economic impact" doesn't ring true. Instead it seems that international air service is one of those badges of being a western state that Israel wants -- while at the same time wanting a free pass on using heavy weapons in urban areas, because after all, Bashar al-Assad is worse. Finally, there were some noises in the cable news cycle, presumably coming from Israeli officials, that the flight cancellation were disrupting Christian pilgrimages. There's an easy way for Israel to deal with that. They could just simplify admission procedures from Jordan at the Allenby Bridge, which on the West Bank side is already very close to Bethlehem and Nazareth. It might be another bout of cognitive dissonance for Fox News viewers to hear that it is possible to go from Jordan to Israel. But perhaps even worse, it would give western visitors using the land crossing an insight into what it's always like for Palestinians wanting to visit the territories. In that previously criticized here MH17 storystream on Vox, Matthew Yglesias contributes One Fact That Explains How Europe Could Crush Russia's Economy. The actual discussion in the text is about trade, but the accompanying chart shows Russia's GDP compared to Europe, the point being that Russia's economy is not that large compared to combined European Union GDP. 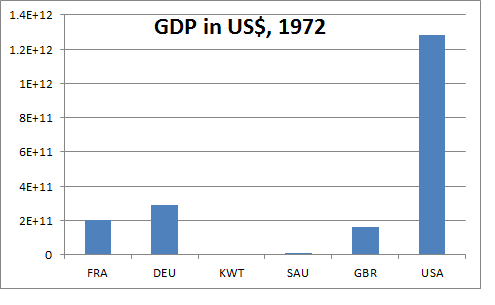 So since this new data-driven wonk journalism seems to be what the kids are doing these days, we've presented up above 1972 GDP (obtained from the World Bank online databank) for the USA, France, Germany, the UK, and the USA compared to Saudi Arabia and Kuwait. We tried to get more Arab countries such as UAE and Iraq but the data was not available. By the logic of the Yglesias calculation, isn't it astounding that a 1973 trade embargo by countries that don't even register on a chart of GDP (and others with no data at all) could cause such disruption to western countries? There must be something special about those countries that is not in the chart (or in the Vox Russia chart) -- what could it be? However, in today's world is increasingly the language of ultimatums and sanctions. The very notion of state sovereignty is eroded. Objectionable regimes, countries that pursue independent policies or simply stand in the way of someone's interests, destabilizing. To do this, in the course are the so-called color revolutions, and if we call a spade a spade - just coups instigated and financed externally ... Often relies on the radical, nationalist, or simply on the neo-fascist, fundamentalist forces, as it happened, unfortunately, in many countries of the former Soviet Union, and what is happening now in Ukraine, almost the same thing - that we are now seeing. ... The asymmetry is complicated even further by the status of these [Gaza] civilians. Under such maddening circumstances, are the adults, in a legal and moral sense, actual civilians? To qualify as a civilian one has to do more than simply look the part. How you came to find yourself in such a vulnerable state matters. After all, when everyone is wearing casual street clothing, civilian status is shared widely ... On some basic level, you forfeit your right to be called civilians when you freely elect members of a terrorist organization as statesmen, invite them to dinner with blood on their hands and allow them to set up shop in your living room as their base of operations. At that point you begin to look a lot more like conscripted soldiers than innocent civilians. And you have wittingly made yourself targets ... Surely there are civilians who have been killed in this conflict who have taken every step to distance themselves from this fast-moving war zone, and children whose parents are not card-carrying Hamas loyalists. These are the true innocents of Gaza. It is they for whom our sympathy should be reserved. The impossibility of identifying them, and saving them, is Israel's deepest moral dilemma.. This referendum, the third, dares the Scots to go the last mile: proposing an independent Scottish state within the European Union, sharing a monarch (after the fashion of Commonwealth countries like Canada and Australia), and possibly a currency, with the rump of the old United Kingdom. Other than the first clause (an independent Scotland would be outside the EU for a long time), the second (Alex Salmond has used a bogus Ireland analogy to explain Scotland's status after leaving the UK), and the third (England will not agree to a sterling union), he's right! Indeed, the problem with the independence proposal is precisely that it doesn't go the last mile and frankly propose full sovereignty and accept that international relations would have to be evolved from risks of isolation and ambiguity -- as the Irish Free State did. So he's right about that last mile thing too! Russia is a regional power that is threatening some of its immediate neighbors not out of strength, but out of weakness. What does that mean when that "weakness" includes handing anti-aircraft systems to puppet-separatist goons? Maybe they did. But you'd think in light of the earlier clowning on alleged ISIS stories, someone might do a little desk research before running with this one. Begin with that claim of an 1800 year old church. Amazingly, it has stood untouched since AD 214! And the evidence for this burning: a photograph which shows a lot of smoke emerging from a cluster of buildings that look a lot more recent than AD 214. At least take a look at Wikipedia's list of Christian sites in Mosul and say which site you're talking about! But no, some actual research might impede your link "going viral." So that's who you're dealing with [in Ukraine]: some mix of civil war reenactor or Tea Partier decked out in revolutionary garb, with a mix of reckless aggression and comical incompetence. Here we have them break into nursing homes to photographs senator's comatose wives; there Putin gives them heavy armaments designed for full scale land war in Europe. Because of course professional militaries never shoot down civilian aircraft, everything that Bashar al-Assad has done with Russian weapons has been completely responsible, and never before Putin has Russia blundered into feeding a war that it eventually could not control! When Ezra Klein left the Washington Post to set up Vox, part of the rationale and sales pitch was that Vox was going to make far better use of frontier web technology to present news and analysis in a more creative and elegant way that the traditional media. Klein and others have hyped up Vox's storystreams -- rolling updates on major events -- as a central part of what's different about their presentation. So go to the storystream on MH17 and what do you see? The latest update is simply the standard calculation of ratio of casualties to population to claim that MH17 is like a Dutch 9/11 in terms of scale (something that apparently never occurred to Ezra Klein before). Nearly everything before that is culled from other media reports, social media, or "researched" via Google and Wikipedia. There are some interesting graphical presentations (e.g. of flight routes) but even these rely on source material of others. And what's missing: no assessment or evaluation of specific policy mistakes and unintended consequences that got us here. Because unlike gee-whizzery with data or maps or #slatepitch lines of argument, that stuff is hard. UPDATE: Right on cue, the problem with relying on other people's material emerges -- the fishy tale of Maarten de Jonge. 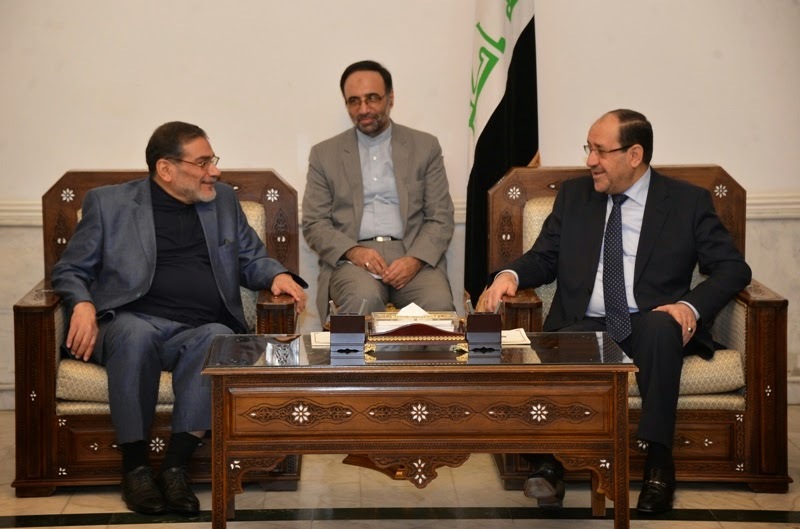 In Baghdad today, Iraqi Prime Minister Nouri al-Maliki meets Ali Shamkhani, Secretary-General of the Iranian National Security Council (unlike the USA, Iran has a functioning National Security Council). What ever could have they have been talking about? Remember all the hype about how ISIS was the world's richest terrorist group due to having robbed US$400 million from "The Iraqi Central Bank in Mosul" (there's no such thing, but anyway)? The Financial Times has an excellent reported story, unfortunately paywalled, which explains that the whole thing NEVER HAPPENED. Retractions will be forthcoming soon from the Daily Telegraph, International Business Times, and all other media outlets which ran with the original story. Right around the time that Vladimir Putin is held to account for MH17. The non-existent bank heist thus joins the ISIS tweet to Lionel Messi and the $3000 Rolex adorning the would be Caliph as fabrications jointly promulgated by a publicity-savvy group and an endlessly gullible link-chasing media pack. On CNN this morning, Wolf Blitzer sets up a segment on the Gaza crisis. Says Wolf: An Israeli operation in Gaza turns deadly with an Israeli soldier killed. In fairness Wolf then went to an interview with Mustapha Barghouti who recounted specific cases of civilian casualties that he had seen. But when Barghouti mentioned that they were being treated in Jerusalem Wolf challenged him as if to say that means the Israelis are being nice and opening the border for medical needs. Barghouti explained that the Israelis won't let ambulances cross the border. Instead, critically injured people have to switch vehicles. Maybe Wolf was having a bad day, wishing that he was in Kiev. For the Palestinians every day is a bad day. "The fact that you have a crisis in Ukraine has nothing to do with Gaza." Yes it's really odd to have these two events linked only by out-of-control non-state actors and states perceiving a foreign affairs free-for-all. Stuff Happens! Above, the leaders of Russia, China, South Africa, Brazil, and India celebrate their agreement to establish a BRICS development bank. The other countries were nicely silent about Russia's annexation of the Crimea. Any chance these fearless emerging market leaders chafing against the established order have views on what happened to MH17? Apparently they were not concerned enough. Mr. Obama's aides said that no single issue links today's crises. Many are still tied to the Arab revolutions that broke out beginning in late 2010. "It's not really the first time it's been like this," said Mr. Rhodes, referring to the simultaneous revolutions the U.S. faced in Egypt, Libya and Tunisia during the Arab Spring. "The fact that you have a crisis in Ukraine has nothing to do with Gaza." With a Russian-backed Baathist regime spawning a regional Islamic insurgency in the Middle East, and Russian-backed rebels shooting down civilian airliners in Ukraine, does the White House really want to claim that these crises have nothing to do with each other? In the battle of victims, Israel is losing–there are more dead Palestinians than dead Israelis. The core abuse was the notion of “royal prerogative,” with the King being able to act unilaterally in his interpretation or suspension of laws. King James I claimed that he was simply applying “natural reason” to the enforcement of laws. He insisted that he had the right and duty to use his own judgment as to the proper course of the government since “law was founded upon reason.” While Kings did not refer to “gridlock,” they denounced Parliament for being obstructionist or unreasonable. King Charles I clashed with the House of Commons for years and even stormed the chamber with troops. He believed in the divine authority of Kings and rejected the most basic notions of shared powers with the Parliament. He was eventually charged with “a high Breach of the Rights and Privileges of Parliament,” including the violation of the “right and power of frequent and successive Parliaments.” These and other conflicts led not only to King Charles I’s execution but also to a strong view of the necessity of the separation of powers in the English, and later the American, systems. Conservatives seem to be lapping up this stuff, but what should be getting attention is attempted mapping of 17th century Britain and Ireland to the current US context without any of the necessary qualifications due to religion or nation. The price today for talking about inflation is itself too high. She then lays out a theory that inflation really is much more prevalent than it appears by citing some specific price increases taken from a ZeroHedge post, which she blends into a narrative about someone needing a holiday because the world isn't behaving according to their predictions -- like Rick Santelli. The prices discussed are revealing: a holiday rental on a cottage (sic), cinema, a $45 child haircut, and out-of-state public college. These are items from a well-off middle class consumption bundle. There's a general point that actual inflation numbers are looking at nationally representative prices of everything consumed by all households and not just some selected items where some people are going to have sticker shock. Shlaes also gives herself licence to ignore the patient explanations of government statisticians about why technology and quality improvements mean that the sticker price is not always the right thing to look at. Finally, these specific examples that do seem to excite the upper middle classes -- summer house rentals, fancy haircuts, and college tuition fees -- are prices that go up because lots of other people like them also want them. That's not central banks printing too much money. That's the Bobo treadmill. It's not a comparison that either of them would like, but Bashar al-Assad and Bibi Netanyahu have a lot in common. Both have the ability to use overwhelming military force against an Islam-motivated opposition. For Israel, it's top of the line military technology, while Bashar sometimes has to resort to cruder methods, like barrel bombs and sarin gas. But both of them had years to pound away at their opposition without much meaningful international protest. And yet in both cases, the opposition is still there. Just where does Bibi expect to be with Hamas five years from now? Bashar al-Assad operated under no rules of war at all, and he couldn't crush his opposition. Israel has to at least try to put up a show of compliance, with the constraints that implies. And although the White House likes to compartmentalize these flare-ups, the non-state actors do talk to each other. Perhaps the most amazing thing is the hubris of people who believe they can calibrate these situations to produce the outcome that they want. It's the Yarmouk camp near Damascus in Syria. That's a lot of money Adidas is paying for the sponsorship rights to Manchester United gear. It's an amount in the scale that has attracted attention before when it looked like it was back-door financing from owners to the club. Surely there is not some Qatar angle to this deal yet to emerge? 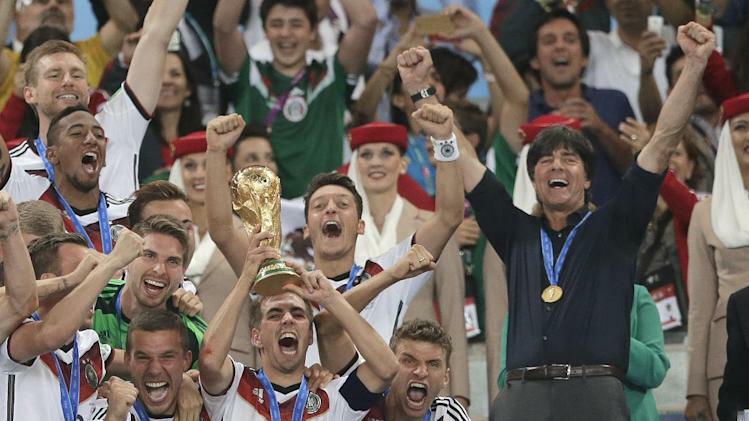 It must have been galling for Lufthansa to see Emirates Airlines -- in the form of flight attendants -- prominently positioned on the podium as the German soccer team accepted the World Cup trophy last night. Higher labor costs due to rising minimum wages and health insurance requirements under the 2010 federal Affordable Care Act will pressure already low profit margins, which for [restaurant] operators range in the low-to-mid single digits on a pre-tax basis, translating into price increases and potential job losses. So it's not just minimum wage laws that are the problem, it's also Obamacare! But not management salaries, cost of inputs, or even changing consumer patterns. Amazing what these credit rating agencies -- which benefit from legal protections on what they say -- find time to comment on. Remember that hilarious story in the Daily Telegraph (and widely picked up) about the ISIS leader who during his speech as Caliph in Mosul undercut his message by wearing a super-expensive Rolex? Sadly, like much of what you read about Iraq in the run-up to 2003, it's not true. The watch is actually a cool but hardly blingy US$330 lunar-oriented device that helps figure prayer times anywhere in the world. Iraq's government has lost control of a former chemical weapons facility to "armed terrorist groups" and is unable to fulfill its international obligations to destroy toxins kept there, the country's U.N. envoy told the United Nations. In a letter to U.N. Secretary-General Ban Ki-moon, made public on Tuesday, Ambassador Mohamed Ali Alhakim said the Muthanna facility north of Baghdad was seized on June 11. He said remnants of a former chemical weapons program are kept in two bunkers there. "The project management spotted at dawn on Thursday, 12 June 2014, through the camera surveillance system, the looting of some of the project equipment and appliances, before the terrorists disabled the surveillance system," Alhakim wrote in the letter dated June 30. The Sunni Muslim group known as the Islamic State is spearheading a patchwork of insurgents who have taken over large swaths of Syria and Iraq. The group, an al Qaeda offshoot, until recently called itself the Islamic State in Iraq and the Levant (ISIL). It's black comedy: Iraq was invaded in search of WMDs that were never found, but the facilities were raided by an insurgent group descended from that invasion and empowered by the fact that WMDs were used with impunity against civilians -- by Bashar al-Assad in Syria. It's unlikely the Syrian or Iraqi people get the joke. MR. SNOW: It has been looked at. It has been looked at. Q Why is it not -- why is it a non-starter? MR. SNOW: It's a non-starter because you don't want to recreate the Balkans. What you have is -- within Iraq there is a sense of national identity, and it was expressed at considerable risk by 12 million Iraqis last year. They made it clear that they consider themselves part of a nation. And the idea of breaking them into pieces raises the prospect in the south that you're going to have pressure from Iran on the largely Shia south; you're going to have difficulties in the north with the Kurds, with the Turks and the Syrians, who are worried about a greater Kurdistan; and then if you have in the middle a Sunni population that has been cut out of the prosperity by oil to the north and south, you have a recipe for a tinderbox. It makes a lot more sense to continue, rather than saying to everybody, go to your separate corners and be different people, to build on the sense of Iraqi identity that was expressed by people who went forward and voted, which is an -- at times when a lot of people were saying, they aren't going to vote, the Sunnis aren't going to participate -- remember all these predictions that were made last year? They turned out not to be true. And so it makes perfect sense to try to work with the Iraqis for what they want, rather than to insist that they follow a path that people in Washington may think is more politically convenient. Q Just to follow on that, pressed on the Balkans issue, Balkanizing Iraq, Senator Kay Bailey Hutchison said, well, the Balkans appear a lot more safe than Iraq is right now. MR. SNOW: Well, again, we stand by our position. We love and respect Senator Hutchison, but on this one we just disagree. Why don't you get Irving Kristol to kill the spider? A blog post title in search of content perhaps but isn't one angle of the Sam Tanenhaus New York Times Sunday Magazine article about the supposedly rising Republican policy analysis constituency in the form of the YG/Room to Grow crowd that they're basically doing what Kristol & Co. were doing 40 years ago, minus the relevance, context, and political influence? It's not the most obvious allusion and it may be entirely idiosyncratic, but to these ears at least, Jack White's Lazaretto has a note/scream or two from the Beastie Boys Sabotage. As the expertly-crafted public relations and social media stunts by ISIS pile up -- declaring a Caliphate, announcing plans to invade Rome, and now a speech in Mosul by "Caliph Ibrahim" -- the resemblance to the Trevor Slattery character in Iron Man 3 grows stronger. Photo of "The Mandarin" from Disney Wikia.